You can hardly see the hiker ! 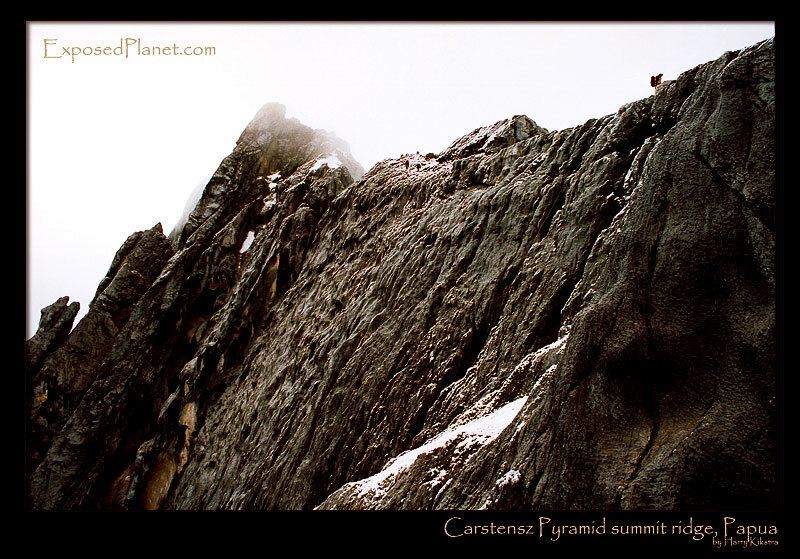 The story behind "Carstensz Pyramid summit ridge, Papua"
a href=http://7summits.com/carstensz target=”_new”>Carstensz Pyramid was named after the Dutchman Jan Carstensz, the first westerner to spot this range -and its glaciers nearby- from the ocean. Located on Papua, formerly Irian Jaya, it is the highest point of Oceania and therefore one of the fabled 7 summits. Though the lowest of the 7, it has some technical rock sections, most of them are located on this summit ridge at about 4700m altitude. The rock is sharp and it rains and snows all day long, just this moment of clearance gave me a chance to quickly take a picture. Wonderful adventure to climb sharp limestone rock near the equator, near people who live in the Stone Age, wearing nothing but penisgourds. Scanned from old kodagold film, shot in October 1999.